The news broke for Aucklanders in the pages of the NZ Herald on the morning of 27 January 1928: two bodies discovered the day before at 12 Raymond Street, in the otherwise peaceful seaside suburb of Pt Chevalier. Peter William Clos, 31, a builder’s labourer and former leading amateur boxer, and his wife Beatrice Mabel formerly Barnett (40) were found with a Belgian mauser rifle converted into a single barrelled shot-gun, a weapon Clos had just purchased and had been seen carrying, wrapped up, into the house the night of 25 January. Mrs Edith Croad, a neighbour from No. 6 calling by at about 10.40 am on the 26th to lend Mrs Clos a book, found the scene. Mrs Clos had been shot in the back of the head while asleep in her bed. Peter Clos shot himself, dressed in his pyjamas, in the living room. None of the neighbours heard the shots; until Mrs Croad’s discovery, no one thought that anything was amiss. Originally born in London, 27 November 1895, his parents Christopher and Anna Clos came originally from Neukirchen in Germany. Christopher Clos (1853-1914), a journeyman baker by trade, arrived in England sometime before 1881, and married Anna Kranz in October 1892. Peter Clos held the Auckland provincial middle-weight championship in his class during 1914-1915, His name spelled in the newspapers as “Closs”. During the First World War, he was a private in the 1st Battalion, A Company, 13th reinforcements, serving from February 1916 until October 1917 when he was discharged as unfit for service due to wounds received in action: a gunshot to the left wrist. A photograph of him in his uniform was displayed on a wall in the Raymond Street home. He briefly returned to boxing in 1921. Peter and Mabel married in 1923, Mabel being a widow with two daughters and a son, the three children staying with the couple until they married or moved out. The Clos family moved to Raymond Street around 1926. Clos had returned home to New Zealand from the war, like so many other servicemen, with mental and emotional scars. “Everything seemed to get on his nerves”, a friend later told the inquest. Thoughts of the war kept returning to Peter Clos in the weeks leading up to the tragedy, leading to and also causing his own lack of sleep and deepening depression, along with an obsessive anxiety about failing eyesight. “I would rather kill myself than go blind,” he told his friend G Lang. Hilda Marion Barnett, Mabel’s daughter, had lived with the couple until six weeks before the shooting, and described Peter Clos as having a “violent temper and given to being sulky.” However, she reported there hadn’t been any discord between the couple. He also constantly worried about his wife’s health and what he described to friends as her sleeplessness. 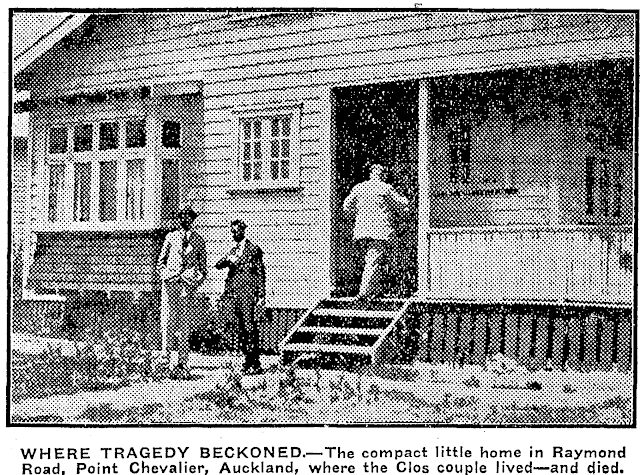 According to Mrs Croad, Mabel had told her on 23 January, two days before, that she and Peter had decided to shift from Pt Chevalier and move to Remuera, intending to sell the piano to buy a motor-car. Yet, according to a witness who knew Peter Clos, he’d spoken of how more and more of his wages was going on “dope” for his wife’s ailments. When it comes down to it, even though the NZ Truth was insistent that there must have been some sort of “death pact” — essentially it was two people living together with their own neuroses, and one knew how to make it all stop. Peter Clos calmly purchased the weapon from the Farmers Trading Company store, asked for large shot, “something that would stop pigs” on 25 January, took it home, and at around 5am the following morning got out of his single bed beside Mabel’s double bed in their bedroom. According to the NZ Truth, based on the evidence at the inquest, he then moved to a spot beside the head of the bed, pointed the gun barrel downward, and killed her. Mabel, doped up on the drugs and painkillers to help her sleep, wouldn’t have known a thing. Peter Clos then turned off the lights, went to the sitting-room, ejected the spent cartridge as he went, and proceeded to the kitchen where he opened the kitchen door for enough light for him to finish things. He then attached a cord to the trigger of the gun, fastened the other end to his toe and, placing the muzzle in his mouth, ended his own private hell. Peter and Mabel Clos were buried beside each other at Waikumete Cemetery. Rather tragic, but well described. I see baby blues and war trauma. That happened to sooo many young men, returning from the trenches of WW1 :( Of course the ex-soldier had mental and emotional scars from the endless massacres. Who would not? I wonder if the army and its doctors saw the tell tale signs:repetitive thoughts of the war, lack of sleep, depression, anxiety and reduced eyesight. And I wonder if anyone offered the poor man some support. Probably not. Unless he was utterly delusional, he wouldn't have seen any kind of psychiatrist. 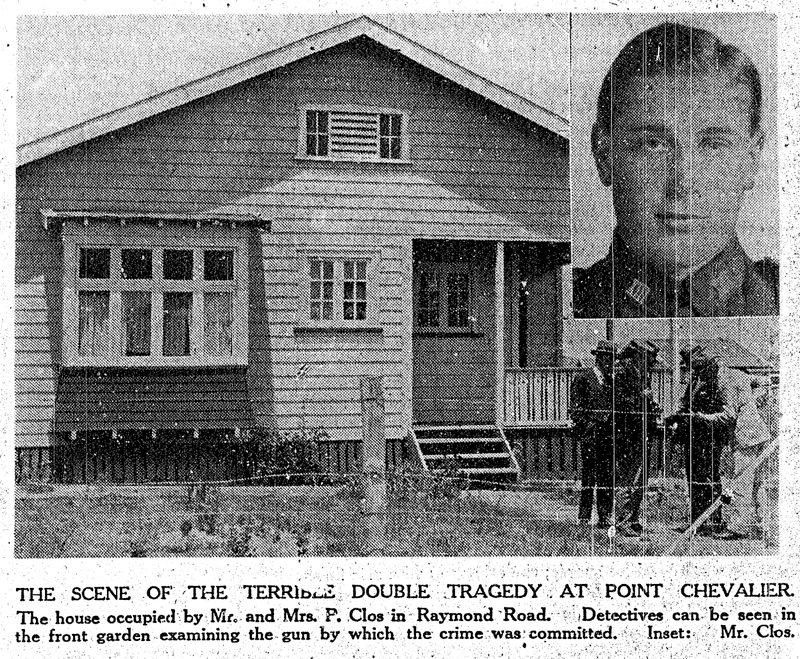 Clos is one of a number of post WWI suicides I'm researching for the Friends of Waikumete at the moment. I live at their former home now in Pt Chevalier and have recently become aware of the tragic events nearly 90 years ago. I am very happy here but there is certainly a very interesting feel and energy in the house.